Best Egg Salad Recipe Ever | Simple. Tasty. Good. Here’s my best egg salad recipe or in other words: my most favorite egg salad! Chunky, crunchy, creamy… it’s got everything I like, it’s got it all. I am very fond of the combination of eggs and mint. They seem to be just made for each other. This used to be one of my regular lunch spreads I would take to the office some years ago when I was still working outdoors. Easy and simple!! This is how I would do it: boil a couple of eggs the evening before, chop the cold peeled eggs up in the morning, add the rest of the ingredients you find below and scoop the whole lot in an airtight container. Hope you got a fridge nearby where you work because you should really chill this eggy salad until lunchtime. 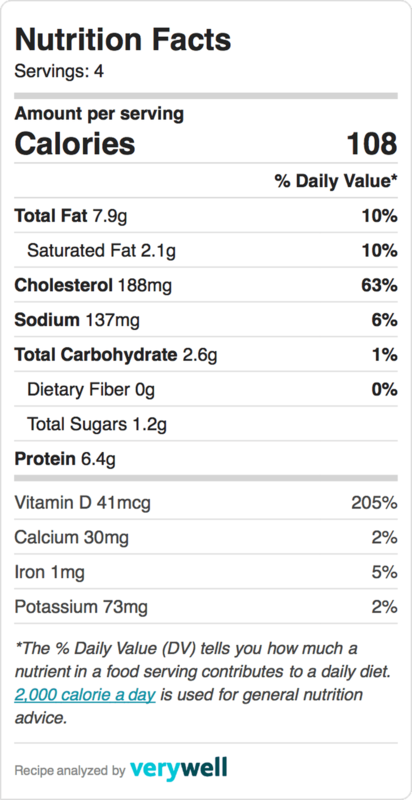 Add a couple of slices of bread, homemade egg salad to spread it with. Sprinkle of paprika powder in the end. Wonderful thing to look forward to while the morning wears on… Only don’t bring it too often to work or you might have to share it with a bunch of other envious colleagues in the end. Don’t tell me I didn’t warn you! 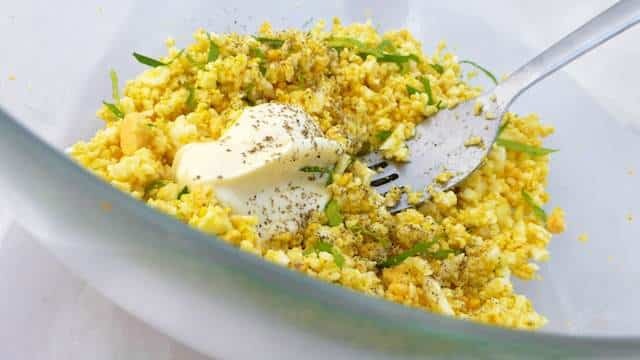 My best egg salad recipe ever: just add a little freshly chopped mint and lemon juice, yummm my favorite creamy egg salad! Fill a small pan with some cold tap water and place it over high heat. 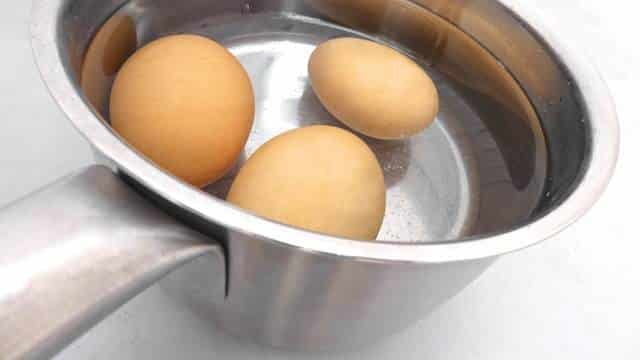 Once the water is boiling, carefully slip in the eggs using a spoon. Boil the eggs for 9 to 10 minutes. They aver to be hard-boiled. Drain the cooked eggs and let them cool down fully at room temperature. Carefully peel them. Rinse the peeled eggs under cold running tap water. Add them to a large mixing bowl. 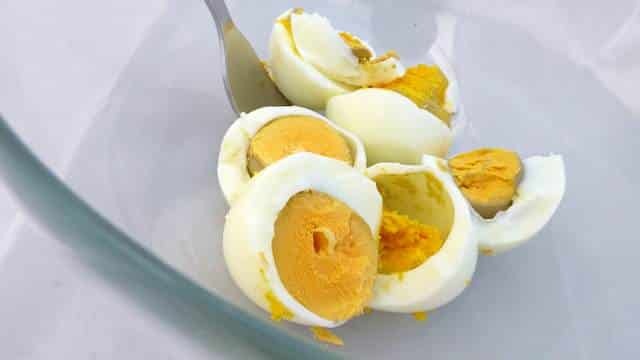 Mash the hard-boiled eggs using a fork. Let's keep the salad a little chunky! Add the freshly chopped mint. Stir well and add the mayo. Season with a little pinch of pepper and salt. 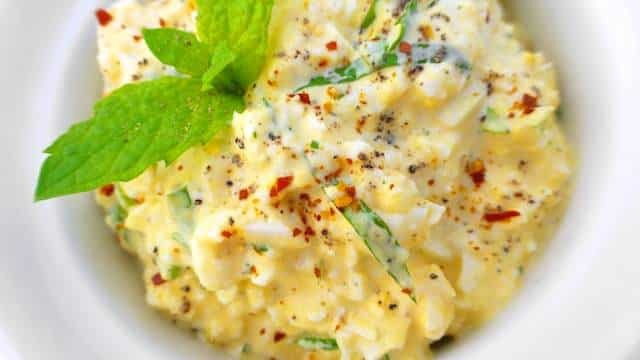 Stir all the egg salad ingredients firmly until well combined and creamy. Then add the lemon juice. Stir well again. Check the seasoning and add extra mayo, pepper, salt or lemon juice to taste if necessary. 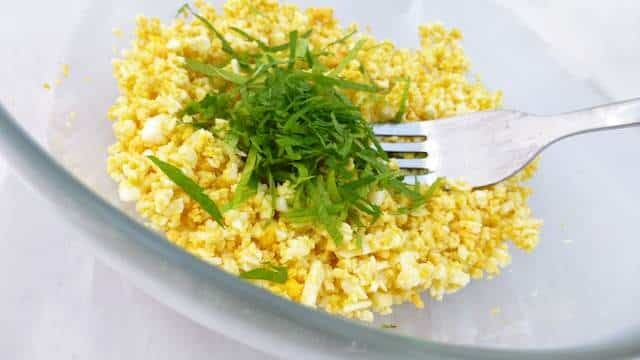 Transfer the egg salad to a clean bowl and sprinkle with paprika powder. Spread it on a slice of bread or toast. Serve at room temperature.